Volunteers carrying rakes head to the site of a subbotnik event in Moscow. 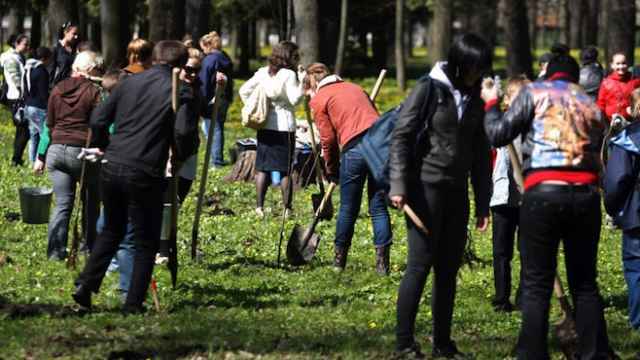 On Saturday, thousands of residents of Moscow and the Moscow region are expected to take over parks in a clean-up effort known as subbotnik. The tradition of "spring cleaning" public spaces dates to the Soviet era, but today organizers are emphasizing the community-building aspect of the event and offering free T-shirts, food and activities for children to encourage participation. 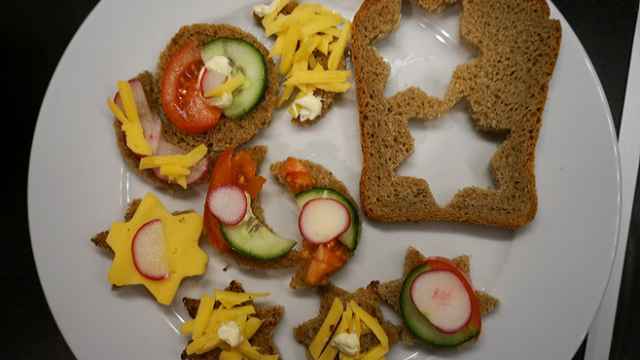 "At school we had subbotniks. We never considered not going. It was just something everyone did," said Maria Shemyakova, spokeswoman for the communal services department of the Moscow region. Now, however, her department wants to promote subbotniks as a way of instilling in residents a sense of responsibility for their surroundings and appreciation for the hard work done by street cleaners, janitors and park keepers, Shemyakova said. 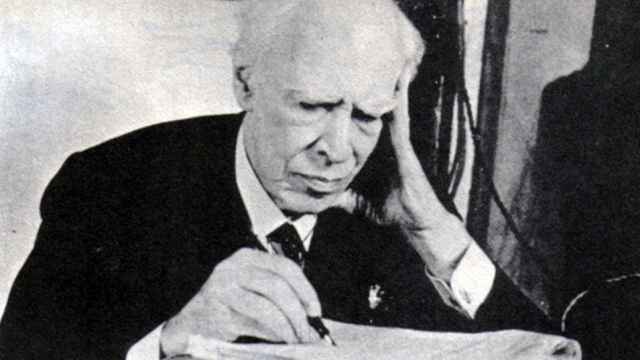 The first subbotnik, whose name is derived from subbota, the Russian word for Saturday, took place on Saturday, April 12, 1919, in the midst of the Russian Civil War, when a dozen workers at a Moscow railroad depot heeded the call of Vladimir Lenin to repair the railways in the war-torn country and spent all night repairing locomotives. In the morning, they drank tea, sang "The Internationale" and decided to spend every Saturday night working "until total victory is won," according to Ivan Burakov, the foreman of a team of mechanics at the depot, who organized the event. The practice spread rapidly and participation in subbotniks became an obligatory part of Soviet life. subbotniks took place sporadically, but a nationwide subbotnik was held every spring on the Saturday closest to Lenin's birthday, April 22. It helped that the weather at the end of April is generally amenable to yard work. Mosgorpark, the Moscow city park administration, is sponsoring two subbotnik days — April 18 and 25. Each of the city's nearly 100 parks will have a subbotnik with a sponsor and a special theme, Mosgorparks representative Darya Simonenko told The Moscow Times. For example, popular website The Village is sponsoring the subbotnik on April 25 in Park Krasnaya Presnya, which will emphasize eco-friendliness, while at sculpture park Muzeon, volunteers can clean artworks and listen to local bands. Elle magazine is sponsoring a beauty-themed subbotnik at the Hermitage Garden that will have a fitness zone and experts giving tips on spring makeup. A full list of Mosgorpark subbotniks is available in Russian here. Expats are also invited to get in on the tradition. For the first time this year, the Moscow Youth Soccer League is organizing a special subbotnik targeted at the expat community. The Expat subbotnik will take place on April 25 in Novodevichy park and include a yard sale, food and activities for kids, as well as cleaning up. Ksenia Mershina, one of the organizers of the event, said that the goal is to help people "get involved" and "get international." 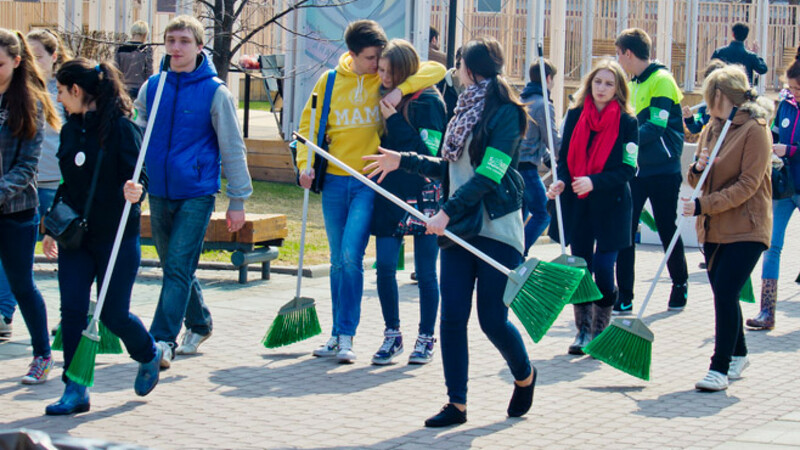 The Moscow region will be holding a subbotnik on April 18 under the slogan: "Clean front yard, clean conscience." Locals can help clean up residential areas and local parks from about 11 a.m. on Saturday, accompanied by live music. In all cases, cleaning equipment will be provided. Moscow region subbotnik participants will also receive free hats and aprons with a special logo. The Moscow City department for communal services announced that last years' subbotniks drew over 2.5 million volunteers from all parts of the capital, and this year's events are expected to attract yet more participants, Moscow news website m24.ru reported in early April. Last year's Moscow region subbotniks involved 300,000 participants. A list of five places where you can take part in a subbotnik this weekend.